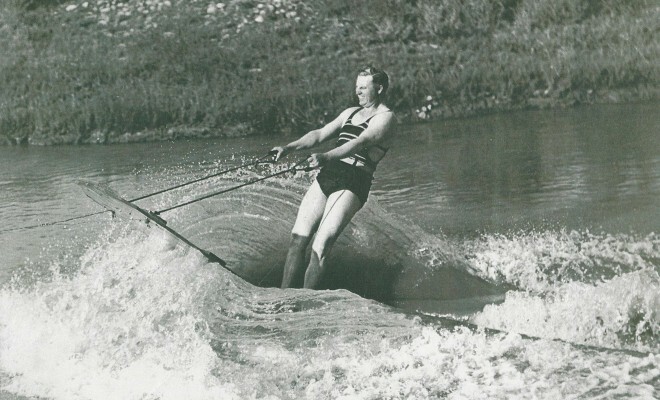 This undated photo, probably taken in the 1930s, is longtime Palisade businessman “Frosty” Tilton on a surfboard on the Grand Valley Canal. The tether rope he is holding in his right hand was attached to an orchard hoopie driven by his wife, Ruth. If you have photos you are willing to contribute for publication in a history book about Palisade, please contact the Palisade Historical Society at (970) 464-2177 or P.O. Box 631, Palisade, CO 81526. Photos will be scanned and originals returned to donors.